Sometime between now and Epiphany I will finish and post my final piece for this blog. My initial reason for leaving Albion Awakening was that I wanted to focus on writing a book-length story. The more I reflected on it, however, the more I realised that the discipline of publishing a couple of pieces a month is good for my writing, so I'm going to start a new blog, though I may take a break from it if ideas emerge for a longer work. Albion Awakening is a rare and precious vehicle for spiritual and cultural transformation. It has been an honour and a joy to be involved. I want to thank Bruce Charlton for conceiving the blog and inviting me to take part, and also to both Bruce and William Wildblood for their searching, penetrative, and deeply insightful posts. It is no exaggeration, I'm sure we'll all agree, to describe Bruce and William as contemporary prophets. They discern the signs of the times, shine a spotlight on our metaphysical assumptions, and reorientate us to our source and destination in God. My vocation is different, however. My gift, I have come to see, is in tale-telling (in the vein of my recent Joseph of Arimathea story, for instance), and that is what I will be focusing on in my new blog, Deep Britain and Ireland, where you will find retellings of the myths and legends that remain so fresh and dynamic - and so important for our future, I feel - on both sides of the Irish Sea. A blog is nothing without its readers, so a profound thank you to all of you who have taken the time and made the effort to read what I've written here. May God bless you all and may your road rise before you, now and always. One of the recurring themes in Archpriest Andrew Phillips' pugnacious blog is a radical restructuring of what we now call Great Britain or the United Kingdom. Fr. Phillips foresees a time when all four realms - England, Ireland, Scotland and Wales - will play a role that is right and proper for them in the ordering of national life. No one realm will dominate; none will feel forced to bend the knee. A natural pattern and harmony will unfold, more akin to the curves, swirls and imagistic beauty of the Book of Kells than the static, one-dimensional form of governance we currently endure. The Palace of Westminster, in Fr. Phillips' vision will become the new and long-awaited English Parliament, with central government relocated to the Isle of Man - within sight, as it were, of all four realms. GB/UK will join USSR, GDR, and other outdated acronyms in the dustbin of history, while the new polity will bear the far more resonant title of The Islands of the Northern Seas. This scenario may or may not come to pass, but it strikes me as indicative of the way our sense of national identity, which until recently seemed so solid, is starting to shift beneath our feet. It was never, I suppose, quite so sturdy as it appeared, but that was certainly how it felt to me growing up in the 1970s and '80s. Despite the Troubles in Northern Ireland and no end of political and social strife, there never seemed any danger of the U.K falling apart or ceasing to exist. It felt far too stable and deep-rooted for that. Was it all an illusion? It's difficult to say, but it's certainly becoming clearer as the years go by, to my mind at least, just what a recent notion 'Great Britain' is. GB took shape in the Early Modern era and reached its zenith in the nineteenth and twentieth centuries. It is losing its imaginative force now, as older patterns, harking back to the Celtic and Anglo-Saxon layers of our history, begin to reappear. Scotland, for instance, already has one foot out of the Union. In Wales, where I currently live, the Welsh language is blossoming, while a distinctly English political and cultural consciousness - though still raw and far from fully-formed - is undeniably taking shape. Localism is attracting the hearts and minds of many. People, in my view, are becoming increasingly aware of what is unique and precious about their particular locality. We are living, as Blue Labour's Maurice Glasman has noted, in a time of interregnum. Established ways no longer compel our attention, while new, emerging patterns are still in a fluid, somewhat unpredictable state. They have yet to take on fixed and solid form. This is exactly the terrain that John Milbank explores in his third volume of poetry, The Dances of Albion (Shearsman Books, 2015). Milbank is also a theologian and political theorist, best known perhaps for his leading role in the Radical Orthodoxy movement in Anglicanism, which aims to show (much as the Inklings did in the imaginative sphere) that creedal orthodoxy is at one far more exacting, far more exciting, and far more fulfilling than supposedly more palatable liberal alternatives. Milbank, generally speaking, is economically left-wing and socially conservative. As such, he has become one of Blue Labour's most authoritative and distinctive intellectual voices. He differs from Glasman, however, in that he strongly believes that Britain's future lies within the European Union. His wants Britain to work alongside countries such as Poland, Hungary and the Czech Republic (together with like-minded individuals and groups elsewhere) to reform the EU from within and steer it in a post-liberal direction. He has gone so far (on his always-stimulating Twitter page) to cite the Holy Roman Empire as the ideal model for a reformed and restructured EU. So he certainly cannot be accused of political correctness in his support for Remain or of acting as a mouthpiece for fashionable, metropolitan opinion! 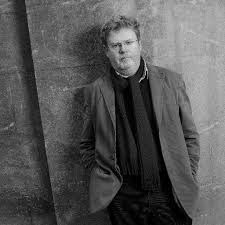 John Milbank has a broad and rich historical imagination. This gives his political thought depth and perspective and helps him frame current events in fresh and imaginative ways. He sees things in wholes rather than parts. He has said, for example, that the real issue in the Brexit debate is not the simple binary question of 'in' or 'out', but rather the nature of the relationship we wish to have with the countries physically closest to us. This isn't an avoidance of what's at stake or a piece of academic obscurantism. It's an approach which goes to the heart of the matter and a question with a lengthy pedigree, going all the way back to the usurper, Carausius, who removed Britain from direct Roman rule for a spell in the late third century. Are we even in a position to answer such a question wisely, however? To understand the type of relationship we want with our European neighbours, surely we need to understand the types of relationship we currently have and would like to have in the future with the different races, traditions and heritages active in our own land. It would be good to feel able to fully interact with the multi-layered historical strata which our national story bears witness to. But an engagement with our past in all its fullness - Celtic, Roman, Anglo-Saxon, Danish, Norman, and more - has not been encouraged in recent centuries as much as it might have been. Since the execution of Charles I and the so-called Glorious Revolution, a Whiggish reading of what Britain is about has come to dominate the intellectual and cultural agenda. This interpretation champions everything rational, quantifiable, measurable and tangible. It has no room for Romance and regards what is invisible as inherently unreal. This is why William Blake railed against it so heartily and why his imaginatively-charged critique of late eighteenth-century mores remains bitingly relevant today. The same narrowing of vision, the same expulsion of the spirit, the same mercantilism and materialism, allied now to an ever more intrusive, ever more tech-heavy bureaucratic machine, still appears to set the tone. It was during Blake's lifetime that Napoleon called the English 'a nation of shopkeepers', and he was right to do so. But that was only what England had become. It was not and is not who the English really are. Not deep down. Not in their essence. And nor is it who they may one day become. This is how the societal change we are beginning to feel might develop in a constructive direction. And this, I think, is what Milbank means on the back cover of The Dances of Albion, when he says that it was 'written in the hope of a true unity of Britain yet to come.' What is in play is a kind of archaeo-futurism, where we draw sustenance and inspiration from the many levels of our pre-modern past, which has been unfairly marginalised by the dominant materialist paradigm. The aim of this reconnection, this return to our source, is not to retreat from the difficulties of twenty-first century life, but to forge a different way of seeing and being in the world, where the past and future join hands, where the circle is made whole, and the sacred restored to its rightful place at the centre of human consciousness. There will be no more alienation then. No more atomisation and fragmentation. We will start to feel at home again - at home in our environment, at home in our bodies and minds, at home in our families, in our towns and cities, and at home with the Divine. to its essence of prophecy. and slurry-dumps at the edge of villages. and mad hopes for a reconquered Britain. divided by the roaring wind. whence came the new line. might belong to a man. are exempted from all work. Nor are these weapons against these. at once regal and popular. dispersed to yet more centres. there would be neither order nor beauty. If there is one action I would encourage us to take after reading this piece (apart from buying a copy of The Dances of Albion, of course) it would be to watch this 34 minute video of John Milbank talking in Moscow about how the new dividing line in theology is not so much between liberals and conservatives as in the 1960s and '70s, but between what he calls rationalists and romantics. Milbank is unashamedly romantic in his approach. 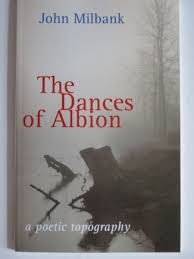 So too, I believe, are the writers and readers of Albion Awakening. So, with this in mind, in my next (and final) piece for this blog, I want to write a fictional meditation on what the coming fall of Britain and the emergence of this new paradigm might look like. it must constitute a centre. would be merely the random. but one great place and centre. Flowers are one of the most perfect symbols of the divine. Can you imagine heaven without them? It would be like heaven without beauty. The splendour of colour points clearly to spiritual reality, and flowers (together with, perhaps, birds) are the most perfect embodiment of colour in this world. Of course, the earthbound mentality will say that the colour of flowers has just evolved to attract insects for the purpose of pollination. But if you really believe that then your spiritual senses are not functioning as they should and you have suppressed something vital within yourself. 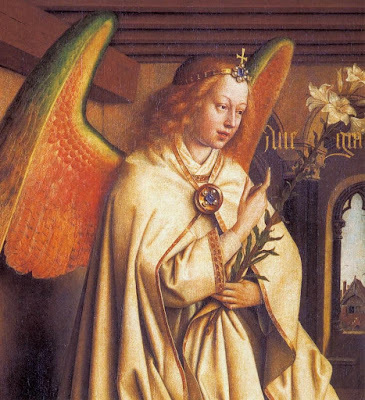 Floral colour may well have such a purpose on one level, for the angelic powers are quite capable of combining material practicality with spiritual meaning, but it is very much secondary. The spiritual always takes precedence over the material even if the material also has its own rights. Flowers are gifts that God has given fallen humanity to remind us of our true home and real state of being. Mystics often describe the higher worlds in terms of the glory of their colour. This is where we originally come from and to where, God willing, we shall return. That is why flowers can speak to us in such a profound way. Don't forget that Eden was a garden. It is fair to assume it was full of flowers, with the gentle buzz of bees and the song of birds joyously celebrating creation. 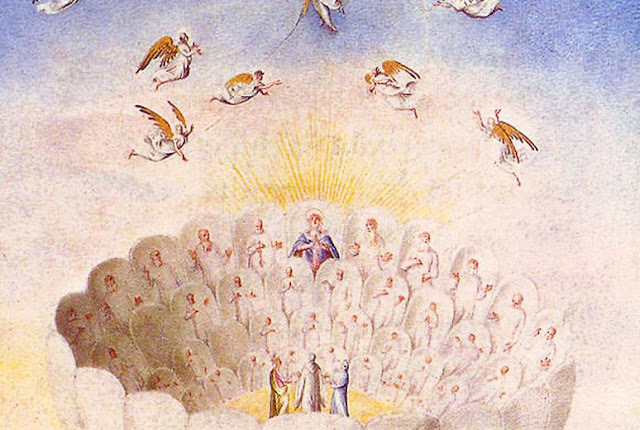 If we try to imagine the process of God creating, a useful image is to picture the pure white light of divine oneness splintering into colour, the seven colours of the spectrum. Some esoteric cosmologies describe these in terms of rays which reflect God's qualities, starting with the primary ones of Will, Love and Intelligence, and then secondary ones which different systems think of in different ways. The pagan gods and goddesses in their highest forms, and the planets, astrologically considered, might also represent this level of reality. So colour is very significant in the context of creation. However, when we look out into the universe, we don't really see any colour at all, certainly not when we look with the naked eye. It is all rather monochrome. So our most vivid experience of colour is through the plant kingdom, and specifically flowers which also give us our most perfect experiences of scent. Again, there is a mundane explanation for that but it doesn't begin to cover the phenomenon in any depth. It may be able to satisfy our curiosity on a purely materialistic level but it leaves the imagination unsatisfied, and it does so because it is a partial explanation which only takes into account the lowest level of being. When we respond to the fragrant scent of a rose, we know this explanation is superficial, and we know it because we are reminded of something very real which is otherwise absent from this world. That is spiritual quality. In terms of symbolism, the rose is one of the most profound of physical objects. But it is multi-layered for it can stand for both heavenly perfection and earthly passion. Then there are the different qualities of the red and the white rose, the red standing for charity and martyrdom (the association with Christ's blood) and the white for innocence and purity. You can see the red as the white that has been through experience and suffering and transformed these into love, while the white is the red purified, spiritualised and returned to the state of divine sanctity. Fertility and virginity. Both are included in the symbolism of the rose. The power of the symbol is that no one interpretation can cover everything about it. It reveals new things at different levels, depending on how you are looking. The rose symbolises the pleroma, the central beauty and perfection of life and God. It is a powerful image of holiness with its petals always unfolding to reveal deeper truths and greater mystery. A rose garden is the symbol of paradise, and the rose itself stands for nothing less than the heart, not the physical pump but the centre of being where is to be found the divine presence. On a less profound level, the rose, of course, is the flower of England. I recently read that Pliny thought Albion might have been so named 'from the white roses with which it abounds' which is not the usual explanation but worth mentioning as it puts the association of the flower with the country way back. The rose is the image of spiritual completion. Hardly less profound a symbol is the lily. This is the flower of the Virgin Mary and all that is associated with her, purity, grace, peace, humility. Here is a picture of the archangel Gabriel holding a lily at the Annunciation. Perhaps of all the flowers, feminine things in themselves, the lily is the truest symbol of femininity, particularly femininity in its purest aspects which means those closest to God and best reflecting the reality that is the Divine Feminine. Its straight stalk is the mind centred in truth, its slender leaves stand for humility, its whiteness is innocence and its fragrance is love*. But the lily is also a common flower used at funerals and for mourning which may be because of its associations with immortality but also transience. Symbols can be complex things due to the fact that they are doorways to the archetypal realm which is the realm of poetry and meaning, not hard physical facts. Consequently, they can include within themselves meanings that, at first sight, might seem almost contradictory. But these meanings are reconciled at the spiritual level where they are seen as different aspects of a single reality. Spiritual truth can often be accessed more easily through images than through words because the image bypasses the thinking mind and so can be a more direct route to truth. There are certain objects in creation that speak clearly and distinctly of higher realities and of these the rose and the lily are amongst the most eloquent. * I took these associations from An Illustrated Encyclopaedia of Traditional Symbols by J. C. Cooper. The other night, while I was doing the dishes, I listened to Supper's Ready by Genesis for the first time in over 30 years. For those of you unfamiliar with the track, it's a 23 minute 'concept song', which takes up the whole of Side 2 of the band's 1972 LP, Foxtrot. As such, it's very easy to deride it as pretentious, overblown silliness. Many have done so, of course, including myself at times. You can see why punk had to happen, in a sense. But as the years go by one gets less uptight about these things and I have to say that I really enjoyed hearing it again. It's such a buoyant work, packed to the brim with lyrical inventiveness and musical dexterity. 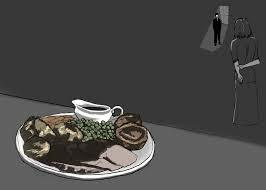 It's hard to believe that Peter Gabriel was only 21 when Supper's Ready was recorded. His voice carries such force and authority, as well as sounding distinctly weird and otherworldly. As for Phil Collins, despite the many low points of his dire (though highly successful) solo career, this track reminds us just what an outstanding drummer he's always been, up there with the best of the best to my mind, e.g. Keith Moon (The Who) and John Bonham (Led Zeppelin). His entry at 4:25 in the YouTube link below is simply magisterial. What struck me most, however, was the deeply eschatological content of the lyrics. I've no idea if Gabriel (who I think wrote the lyrics) is or was a Christian, but the New Testament motifs in the song are remarkably overt. Nathaniel Barlam's artwork, in the outstanding video below, highlights this aspect really well. It's utterly unthinkable that a contemporary UK rock band would take on such a theme and from such a blatantly pro-Christian standpoint. We'd be far more likely, in my view, to see something in the style of David Bowie's sinister Blackstar video, where the Father of Lies (for surely it is he) is welcomed as a liberating force. Today is the second Sunday of Advent, and the Church invites us to contemplate Christ's coming again in glory at the end of time. To be honest, I think we could do a whole lot worse at this time of year than listen to and reflect on this song. There is also, I should say, something archetypally English about Supper's Ready. You'll know what I mean when you hear it. This song just couldn't have been conceived or written in any other country. Whether the English are still capable of such creative bounce and flair is, of course, another question. The early 1970s (my early teens) were a period of economic decline and national political pessimism; but also a time when there was considerable hope about a possible desirable future - utopianism was having its last big phase. Since the later 70s there have been periods of greater national energy and economic-political recovery; but never any formed optimism. Now, it is clear enough to me now that the early-70s optimism, and belief-in a coming transformation of society was delusory - nonetheless it was a fact of life. For example, when I turned 17 I did not bother learning to get a driving license, because I was confident that cars would not be around for much longer: I believed that the demise of our industrial society was imminent, and that was what I wanted. I envisaged a village-level and more communal life - much like Medieval times but minus the Warrior Lord and the Priests. 1. Raise the standard of living of the ordinary peasants above subsistence to a reasonable sufficiency. 2. Increase the amount of discretionary leisure from minimal to ample. 3. And, thereby, enable people to do what they deeply wanted to do; which was (I thought) to replace the business of fighting and religion with a great expansion of arts and crafts - and, implicitly, sexual freedom too, although I did not articulate this. This utopian vision owed itself to a combination of William Morris socialism through to RH Tawney, and the self-sufficiency/ ecology/ Small is Beautiful movement as advocated by the likes of John Seymour and EF Schumacher. It was also sustained by great love of Tolkien, and of folk music. What happened as the seventies proceeded (the balance inflecting probably from 1976-7) was that this vision gradually soured and darkened - and dystopia became more and more dominant; and has stayed. The hedonic, creative paganism of my vague daydreams was replaced by instinctive savagery or actually demonic activities. Of course, my early teen daydreams were false and impossible, and could not really have led to anything Good - and I suppose this fact was gradually brought home. But this necessary disillusion did not lead to deeper insight (i.e. not to Romantic Christianity) - but only to that materialistic cynicism and implicit despair which has so very-completely corrupted my generation. Time horizons have shortened, the capacity - and desire for - coherent consecutive thought has all-but disappeared from general public discourse; the focus is on forgetting oneself in self-indulgence and current happiness while signalling dominance and sexiness; alongside an official-bureaucratic culture of moral self-congratulation/ fake-ideals/ manufactured 'passion'/ permanent guilt; that is going nowhere but to a world of microchipped semi-humans dwelling in a web of convincing-illusions - a virtual techno-reality provided-controlled by a centralised organisation that we hope, but don't actually believe, will be benign. In short, we utterly failed (as a society) to learn from the dreams and disillusion of the 1970s; we failed then, and we have since doubled-down on this failure. As is the custom, I got my son an advent calendar recently which he started opening on 1st December. It's surprising how hard it is to get one with a religious theme nowadays (can you imagine a couple of generations hence people saying, "Christmas is a Christian festival, really?") but we succeeded though it was not possible to find one without chocolates which I (not he) would have preferred. Anyway, at least this one had a picture of the crib and Mary and Joseph in the stable with the three wise men and shepherds standing around, and the star shining brightly overhead. It also had sections of the story behind each window which you can read as you eat your chocolate and so actually consider what it's all about. This my son seemed to do because he asked me this morning if it was true that Mary was only 13 when Jesus was born. He's 13 so that seemed, as he put it, weird. This did ring a bell with me so I looked it up and, sure enough, it is thought she was around that age. Apparently Jewish girls at the time were betrothed at about 13 so it is possible this was something like her age at the Annunciation. I don't know what the average lifespan was in those days but if Jesus was 33, as traditionally assumed, when he was crucified, that would put her in her late 40s. As she is supposed to have lived quite some time after that, it seems plausible. Anyway, this piqued my son's interest, and in some way the fact of Mary possibly being the same age as him made the story come alive a little bit more than usual. He, like most children properly exposed to it, has always loved the Christmas story and not just because of the association with presents. The story really is magical even if many of the elements we now think of as essential don't find much support in the Bible. No matter. The Holy Spirit, I am sure, is more than capable of inspiring human beings with aspects of the Nativity tale that are poetically true even if they are not literally so. And they may even be literally true as well. But what matters is the spiritual effect, the conjuring up of mystery and wonder, the mixture of high and low, angels and beasts, wise men and shepherds, almighty God and a little baby, a shining star in a dark winter's night over a humble stable, all things that strike a note of profound recognition in us. We acknowledge the story as something that is true on a deeper level than mere fact. We are in the realm of archetypes, and our imagination responds to this meeting of the divine and the human with the joy that comes from a sudden clearing away of the clouds of worldly ignorance and a revelation of spiritual truth. Now we can see Mary as a mother but in some ways not much more than a child herself. This does seem odd to us today, very odd if the truth be told. But people probably matured earlier and grew up more quickly in those days. Be that as it may, the point I wish to make is the life of Christ really is the greatest story ever told, and the beginning of that life has a quality of such magic, purity and holiness about it which is recognised by all children before they are corrupted by this world. If we have to become as little children before we can enter the kingdom of heaven (and we do), then we need to get back to the Christmas story and use it to cleanse ourselves of worldly cynicism and intellectual sophistication and even the sort of attitude towards spirituality that seeks esoteric knowledge or higher experience for the earthly self. Only the truly innocent can know God. Perhaps that is part of the Christmas message we need to hear more than ever these days.